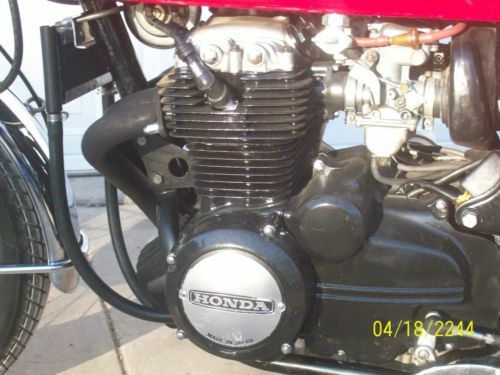 You will usually find a couple different Honda CB’s on eBay at any one time. From the small 350’s, medium 400-500’ and the largest 750’s. 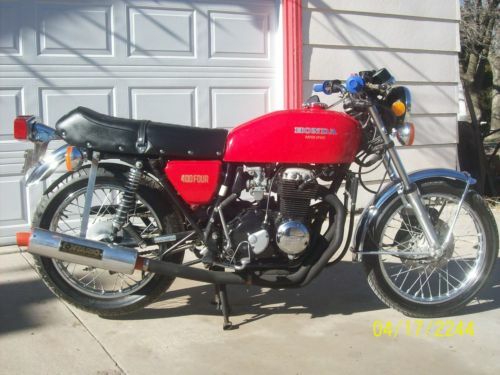 This 1975 CB400F currently on offer is a little bit different, in that it is not a perfect original, or a rat café racer. It falls somewhere in between. So if you are unsure which way you would like to go with a Honda Four, this one would fit right in the middle. 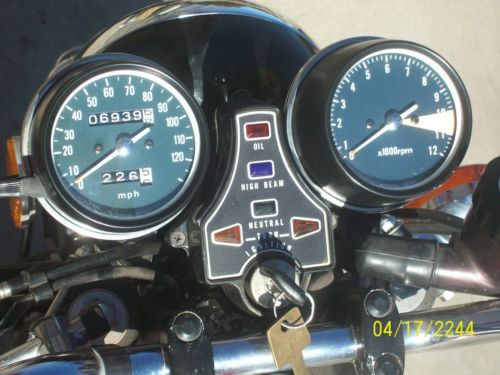 This bike has always been garaged since I took possession in 1986 with 3327 miles on it. It comes with a clear Kansas title. Original engine was removed and replaced with an engine that I hopped up from another bike in 1992. I was able to find some stock original numbers for the 400 Four, but I think the modes done by the seller may outpace the factory. 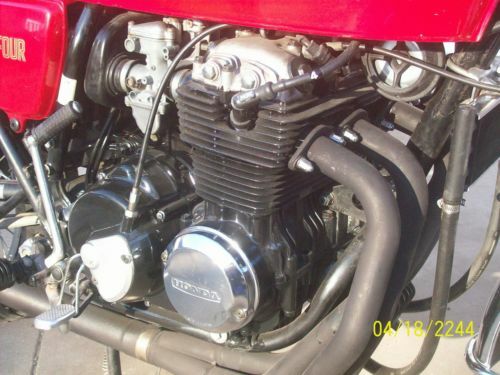 Back in 1975 off the showroom floor, you would get a 408cc engine by way of 51x50mm bore and stroke with 9.4:1 CR. Four 20mm Mukumi’s would power you to 37hp at 8500rpm. Now some of the upgrades that the seller points out would help to bump all these numbers up. 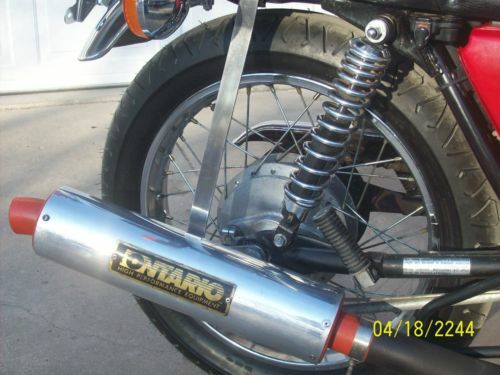 Now when I saw this highlighted CB400F, I also saw right above it was this stock example. The seller of this bike was nice enough to give us some great information about the bike, and I will add it here for all our knowledge. The CB400F was a very successful motorcycle in club or privateer racing. KazYoshima and other racers were able to take Honda’s little 408 cc engine up to 490 cc and with the addition of other racer options, this small bore was considered a ‘giant killer’. Confusion often arises over the two models that were produced. Earlier ‘F’ models had a plain red or blue tank and side-panels running to frame number 1073399. The tanks only bore the words HONDA Super Sport, and the side-panel logo used a font wherein each character was represented by three parallel lines depicting 400FOUR. Up to frame number 1056883 ‘F’ models had swing-arm mounted pillion footrests, but from then on the ‘F’ models had the pillion footrests moved to frame-mounted brackets; it is often assumed that this feature only started with the F2 model but this is not the case. The F2 model commenced with frame number 1073400 and featured a new paint scheme: ‘candy antares red’ or ‘parakeet yellow’. The new paintwork featured stripes on the tank and had a different, angular, font for the ‘400FOUR’ label on the side panels. The F1 model was not shipped to the United Kingdomor Europe. It featured typically a plain yellow tank and black side-panels with the F-type early logo.. Today it is not uncommon to see examples restored with F2-type paintwork but F-type logos on the side panels, or F-type early frames with F2-type paintwork.